Back in the late 60’s (sorry, most of that decade is a bit hazy…), I was in a recording studio on West Division Street in Chicago. It was a little store front setup, lotta shag carpeting, kinda dusty, and the (we figured) launching pad for our star studded career. When we got there, a local Gospel group was behind the glass, workin’ on a tune. All the instruments were being recorded live; drums, guitar, bass… and when the band in the studio found out we had a keyboard player, it was drums, guitar, organ and bass. One of the things I remember was a young kid named, Gary Coleman, playing a Fender Precision, but with a shorter neck. After they were through with their session, I asked the kid (or Gary) what was up with the bass. He showed it to me and let me play it for a bit. Turns out it was a Fender Mustang bass. White, rosewood fret board, light and well balanced. 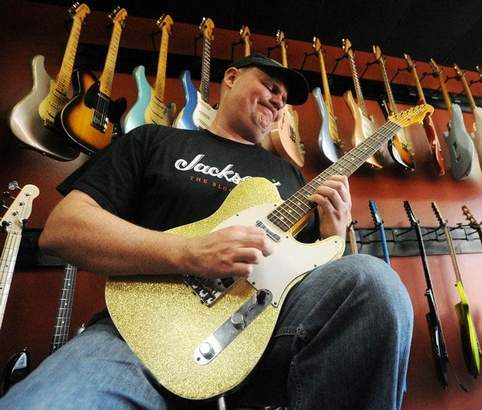 Plugged in, it sounded just like its larger sibling, the Fender P-bass. Now Gary didn’t have very large hands, in fact, he wasn’t very large at all so the bass was very proportionate to him. As it turns out…THAT was the whole idea behind the short scale bass guitar, ok, one of the ideas. The other was to make the transition to the bass easier for guitar players; a fast, light action and a neck that resembled a guitar neck. The idea caught on somewhat, but I believe that a lot of guitar slingers turned bassists thought that the short scale bass was, well…for pussies. NOTHING is farther from the truth. Check out Birdsong basses and guitars at www.birdsongguitars.com and give a look to the serious, I mean SERIOUS short scale basses that Scott Beckwith builds at his shop in Wimberly, Texas. Simple to exotic woods, cool electronics and a bunch of well thought out features that all of his instruments are centered around. I own a couple of short scales; an early Gibson EBO and a Danelectro. The Dano has had a new adjustable bridge put on it (as opposed to the chunk of wood that was the original) and soon a new Hipshot Retro bridge will be on the Gibson to replace a bridge that was, I believe fashioned from an old Buick bumper. I’ll take the Dano to a gig every now and then just for fun; those “lipstick tube” pickups really have some major punch. 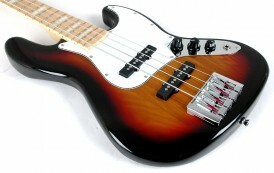 A surprising number of short scale basses are available, well within our $500.00 limit. Squeaking in at just under 5 Franklins is the Hofner Icon Series Vintage Violin Bass. Rosewood fret board, real spruce top and laminated maple back and sides and, if you really wanna get some of that Cavern Club mojo goin’, it comes in a lefty model, just like the one Sir Paul played. To me, a Hofner is an acquired taste, though certainly worth your time spent on a test ride. Dean (yes Dean!) makes the EVO XM. Light mystery wood with a maple neck and a rosewood finger board. TWO humbuckers should get your attention and it’s inexpensive too! Squire has re-introduced the Mustang bass, I believe in the $200.00 range, as well as Epiphone doing a very good job on a replica of the EBO, also around $200.00. My working basses are Fender Precisions; a 74’ and a 78’ (says Larry) and I love them both dearly. BUT, it’s no secret that I’ve become quite a fan of the quality, affordable product that comes from Ibanez, out of somewhere in the Far East. My last article touted the Ibanez SR300. Well guess what? Ibanez also makes this cool little short scale called the GSRM20 Mikro Short Scale. It’s got a 28.6” scale and is especially suited to younger players. I’m guessing they went with agathis for the body (though Ibanez calls it Mahogany, which I guess it sorta is), but the rosewood fingerboard and reasonably finished medium frets make for a very playable little bass. They even put on a P-J Bass pickup configuration that makes this little monster sound much bigger. 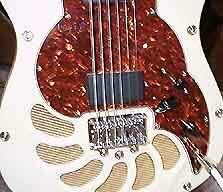 Discuss bass guitars at www.gear-monkey.com guitar message forum. Check ‘em all out and I’ll bet you’re surprised at the good things that come in these small packages.